Bonus offer! Save 30% on any webinar purchase when you subscribe to Tennessee Attorneys Memo today! Simply put both products in your cart and use coupon code LEGAL30 at checkout to get the discount. Tennessee appellate courts hand down 2,000 decisions each year. Only 200 are published. Can you afford to miss one that affects your case? Can your client? Since 1975, Tennessee Attorneys Memo has been the comprehensive information system summarizing all opinions rendered by the Tennessee Supreme Court, Court of Appeals, Court of Criminal Appeals, and Workers’ Compensation Appeals Panels. 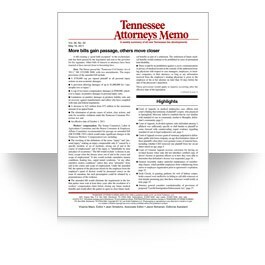 Tennessee Attorneys Memo is a comprehensive information system that brings you fast-read weekly summaries of all opinions rendered by the Tennessee Supreme Court, Court of Appeals, Court of Criminal Appeals and Workers' Compensation Appeals Panels. TAM is not just a digest of state appellate court decisions. You’ll get a weekly story on legal and legislative developments in Tennessee. Plus, summaries of all public chapters of interest to attorneys, all attorney general opinions, and selected opinions from the state trial courts, state administrative agencies, the U.S. Supreme Court, the Sixth Circuit Court of Appeals, U.S. District Courts, and U.S. Bankruptcy Courts. Access to TAM Online, a searchable database of over 70,000 summaries that have appeared in TAM over the past 39 years. You can find cases on particular topics, trace the subsequent history of a case, or check to see if a decision has been published. Subject matter and alphabetical indices, updated weekly and available online. TAM Bytes e-mail alerts on significant appellate court decisions for the previous week. You’re made aware of the hottest decisions, instantly.